Musquash Fire - Rescue is a Local Service District Fire Department with approximately 50 volunteer members, including 4 founding members and Fire Chief of 30 years. Our budget is managed by the Fire Chief and overseen by the Musquash Local Service District Advisory Committee. 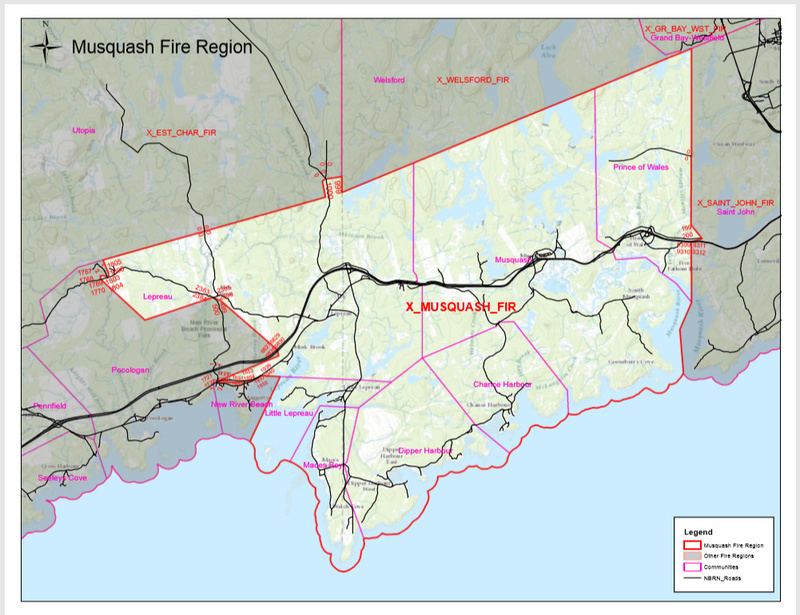 Musquash Fire - Rescue has been serving the communities of Chance Harbour, Dipper Harbour, Lepreau, Little Lepreau, Maces Bay, Musquash, and Prince of Wales since January 1, 1987 providing fire suppression, salt & fresh water rescue, remote off-road rescue services and other assistance in times of crisis. Musquash Fire Rescue responds primarily to fire related incidents and motor vehicle accidents, but does, on request provide Medical Assistance to the local ambulance service, Ambulance New Brunswick. In case of an emergency at Point Lepreau, Musquash Fire - Rescue is the first off-site fire department to respond. The department started with two fire trucks (originally lime green in colour) and two fire stations. Currently the department's apparatus roster consists of four pumpers, one rescue unit, two all-terrain vehicles, three zodiac rescue boats, a Sports Utility Vehicle, two four wheel drive pick up trucks and other specialized equipment housed in two fire stations. All apparatus are red with the exception of one of our four wheel drive pick up trucks which is black with red and gold striping. Unlike most volunteer fire departments, Musquash Fire - Rescue is unique in its partnerships and their requirements. These unique requirements drive Musquash Fire - Rescue to maintain a high level of expertise in many multifaceted disciplines including, but not limited to, vehicle stabilization and extrication, fire fighting, marine/fresh water rescue, hazardous material response, ice rescue, working within a nuclear environment, natural gas, first aid, off-road rescue and wild-land fires. Musquash Fire – Rescue has its own in-house qualified instructors providing professional training to our members and many other fire departments within New Brunswick. Not only are we situated within a recreational paradise, but we also have a nuclear power plant, a major highway, 2 pipelines, the Bay of Fundy, several dams, four public wharfs, a marine protected estuary and a large watershed within our area of care. We are privileged to be partnered with Point Lepreau Nuclear Generating Station (PLNGS) and to our knowledge are the only external fire department that is nuclear trained. In the unlikely event that an incident should occur, Musquash Fire - Rescue is the PLNGS 1st response partner. With nuclear safety being the primary focus, our firefighters are trained to work within a nuclear environment and participate in regular joint training, drilling and planning session at PLNGS. Musquash Fire - Rescue collaborated closely with PLNGS and often play a pivotal role in the multi-tier and jurisdiction emergency exercises. In times where assistance may be required, Musquash Fire provides reciprocal mutual aid to our neighbouring fire departments (Eastern Charlotte & St. George). Route 1 is the busiest highway in New Brunswick. It begins in the west from the Canada–United States border at St. Stephen, and runs east for 239.11 kilometres (148.58 mi) to Route 2 at River Glade and as such is the foremost route for import & export between the USA and Eastern Canada. Musquash Fire – Rescue is responsible for all incidents between Mile Marker 74 and Mile marker 105 whether that be vehicle accidents, spillage or other incidents or departments requiring our expertise. Traversing through the Musquash area are two pipelines. As first response, Musquash Fire - Rescue collaborates closely with both providers and participates in regular joint training sessions ensuring that the required expertise and skill-sets needed in the unlikely event of an issue are maintained. The Maritimes & Northeast Pipeline (M&NP) is a 1,101-kilometre mainline transmission pipeline built to transport natural gas from developments offshore Nova Scotia to markets in Atlantic Canada and the northeastern United States. The Brunswick Pipeline is a 145-km natural gas transmission pipeline supplied exclusively by Repsol Energy Canada Ltd. The pipeline extends from the Canaport™ Liquefied Natural Gas (LNG) receiving and re-gasification terminal in east Saint John, New Brunswick, to supply current and future markets in Canada and the US Northeast. Brunswick Pipeline is owned and operated by Emera New Brunswick. The 30-inch diameter pipeline extends through southwest New Brunswick to an interconnection with the Maritimes & Northeast Pipeline near St. Stephen, New Brunswick. Except for seven above-ground facilities, the pipeline is buried for its entire length. The East and West Musquash Watershed is home to numerous lakes, reservoirs, rivers, Musquash Estuary Marine Protection Zone, camps and 5 dams which are susceptible to spring flooding. Musquash Fire - Rescue provides timely response to the watershed area whether it be rescue, first aid and/or evacuation in times of crisis. Our specialized training and equipment ensures that residents and pleasure seekers alike have qualified and dedicated individuals to assist them in their time of need. Situated on the Bay of Fundy, Musquash Fire – Rescue provides services for four federally owned fishing community Wharfs at Little Lepreau, Dipper Harbour, Chance Harbour, Prince of Wales and is a member of the Canadian Coat Guard Auxiliary. Musquash Fire – Rescue is authorized to issue Civic Address numbers and has the facility to make the civic house sign. The current shoulder flash was designed in 1998 with changes made in 2008 which removed "Fire Dept" and replaced it with the Canadian flag. Included in the centre of the traditional Florian Cross is a map of the Province of New Brunswick. On the map is a nuclear atom and isotope symbol, representing the close relationship that Musquash Fire - Rescue has with Atlantic Canada's only nuclear power station at Point Lepreau, operated by NB Power.